Edgartown - Edgartown is a scenic seaport village. Many of the beautiful antique homes that line the streets of this charming community were built in the seventeenth and eighteenth centuries. The main section of town is graced with stately captain's homes that were built when Edgartown was a prosperous whaling community during the 1800's. 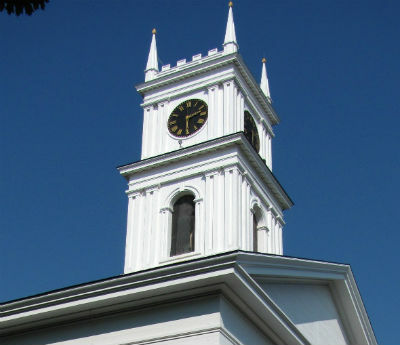 The massive "Old Whaling Church" that dominates Main Street was built in 1843 and is a well-known Vineyard landmark. Chappaquiddick Island is one of the most beautiful parts of Edgartown. With gorgeous beaches and hundreds of acres of preserved land, it provides a habitat for many endangered species of plants and wildlife. Other beaches include the public East Beach, providing secluded swimming along its six miles of coastline. Fuller Street Beach has warm serene waters and is also open to the public. This beach is popular for families and picnics. South Beach is one of the most popular beaches on the island and has protected waters on the Katama Bay side. Lighthouse Beach is a great spot for a picnic. Edgartown Great Pond is popular for water activities, like paddling and windsurfing. Other outdoor activities include biking along the trails in the State Forest, hiking in the Caroline Tuthill Preserve, and walking around Morning Glory Farm. Felix Neck Wildlife Sanctuary offers miles of trails and spectacular views. Golf enthusiasts enjoy playing a game at Vineyard Golf Club and Edgartown Golf Club. Modern-day Edgartown is a delightful place to enjoy a lazy summer day browsing through its many shops or dining at any of its fine restaurants. There are also some good pizza places, delis, and old style diners. Martha’s Vineyard Art Association is in Edgartown Harbor, along with some art, jewelry, and clothing shops. Main Street is home to many local boutiques and specialty stores. Take a stroll down by the docks and you'll see why Edgartown is best known for its yachting community. Search current real estate listings in Edgartown.